Welcome Baby D to the Akron newborn photography blog! 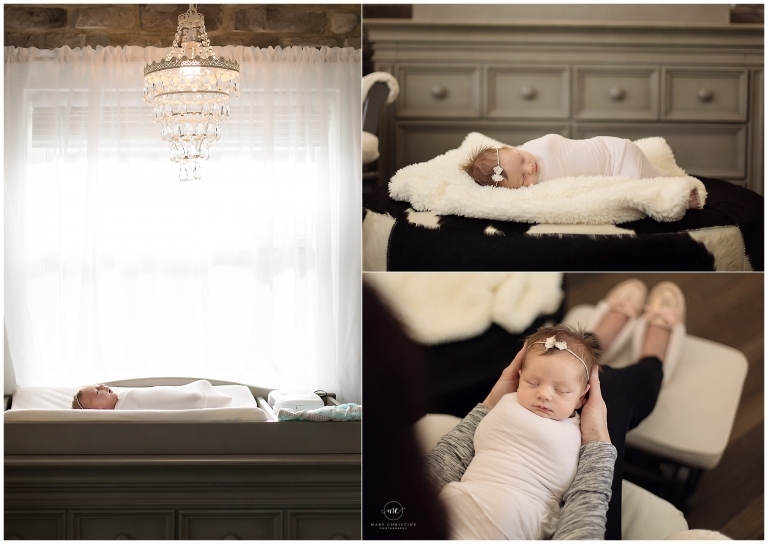 Her lifestyle newborn session was so dreamy! There is something so intimate about capturing a new baby at home. Can we all just stop and take a moment to admire this nursery? It has a STONE WALL. Say what? Right?? Of course I stopped in my tracks and just admired the entire set up. The chandelier is to die for too! Can I have one in my bathroom? I will also take the cow hide ottoman and the grey furniture. Simply divine. This little lady loved being swaddled and loved the white noise app that I have on my phone. Confession: I still use it when we travel for my kids. In fact, we all sleep with white noise makers! These stretchy wraps from Cloth Apothecary make the swaddling so easy. Hands down my favorite! 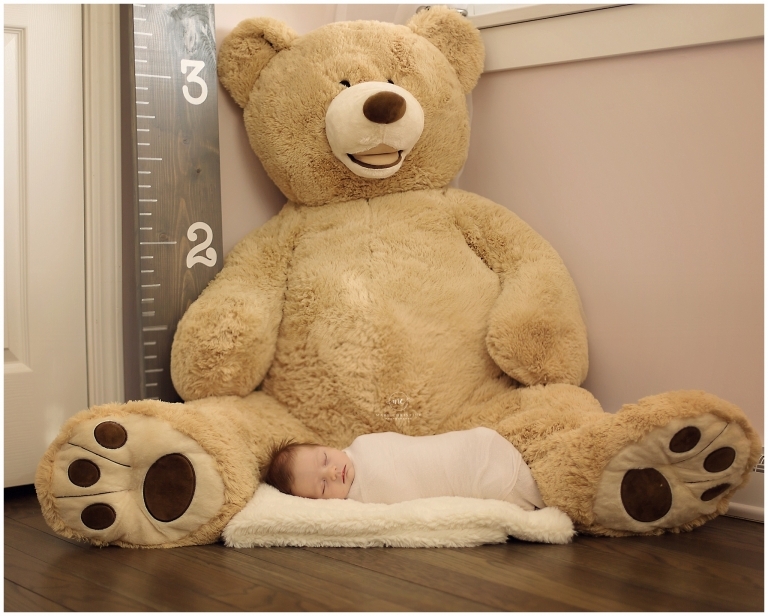 How adorable is this big bear that her momma’s coworkers got for her baby shower? It shows just how tiny little Miss D really is at just three weeks old! I love that this growth chart will be with her as she grows up. While most of the newborn sessions that I offer are done in studio, lifestyle sessions are offered in the home. These sessions are just like this one, where the focus is on the baby in their environment. There are no props or fancy set ups, just baby at home. If this type of session interests you, please contact me today to discuss if a lifestyle session is right for you. I am happy to discuss all the options with you! Thank you so much for stopping by the blog! Looking for Akron newborn photography? Please check out similar sessions on the blog. I would be so honored to be your newborn photographer!